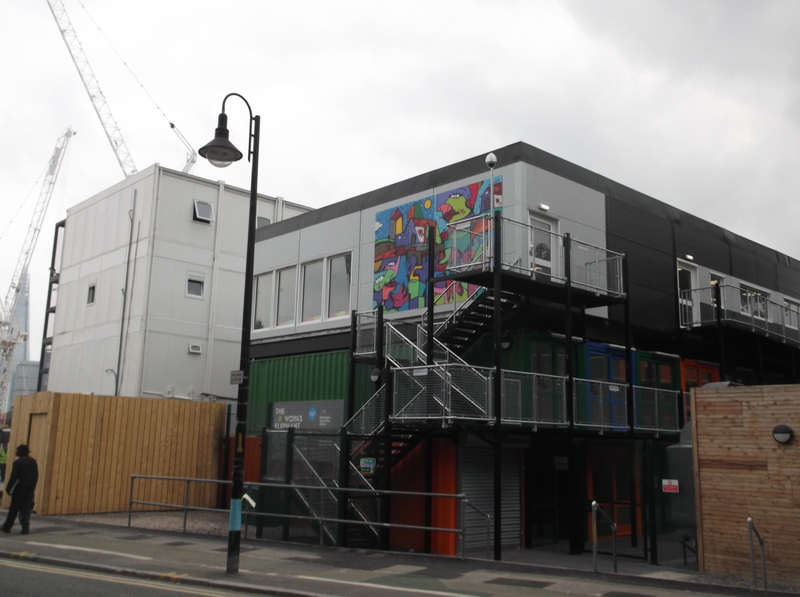 THE ARTWORKS BOX PARK | Southwark Notes - whose regeneration? 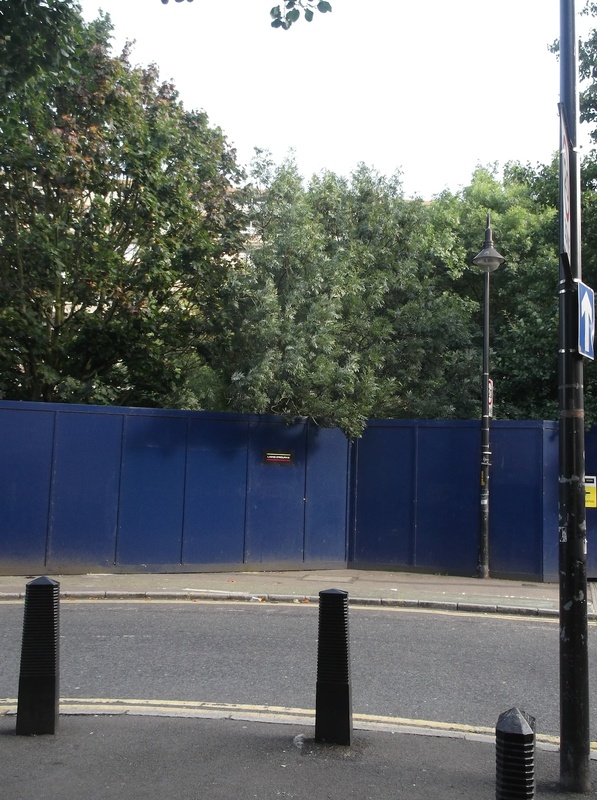 SUMMARY: Public park taken away then given back under false pretences in the guise of community use – Southwark Council, The Artworks, Lend Lease. Yes, it’s another long post ahead! 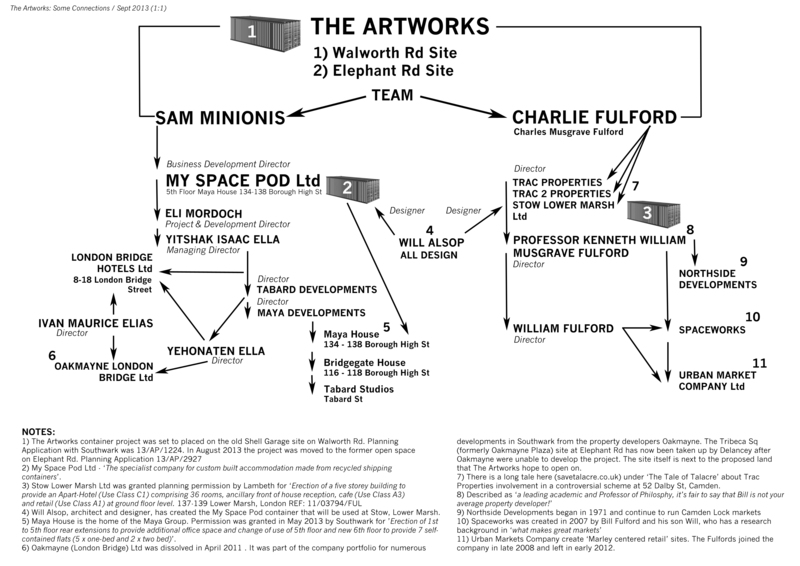 Here at Southwark Notes mansions, we have been following the unbelievable saga of the planned The Artworks ‘arts and creative enterprise community‘ for Walworth with er….disbelief. 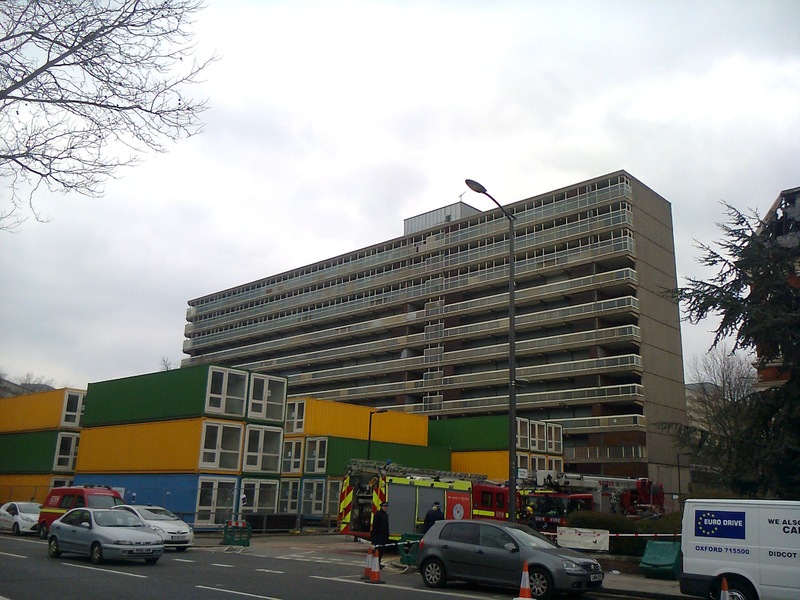 Long before the large yellow and green ex-shipping containers arrived at the old Shell Garage site in front of Swanbourne block of Heygate Estate, long before before the invention of the Flat White coffee and probably long before even Picasso died. Well it does seem that long to us as Artworks has been rumoured, planned, delivered, amended, delayed and now hoping to move to a new site. We have a lot of things to say on this proposed Lego-land labyrinth of creative types and market-as-theme park for urban adventuring amongst the, by-now everywhere, ‘Pop-Up’ Street Food places. (A fellow traveler of ours describes these places as ‘Throw-Up shops’!). We are also wondering whether Artworks are renting the land from the Council and on what sort of lease? However, we are gonna set those opinions aside as we prefer to begin our first exploration of what we are calling Regeneration Seeks Amnesia. 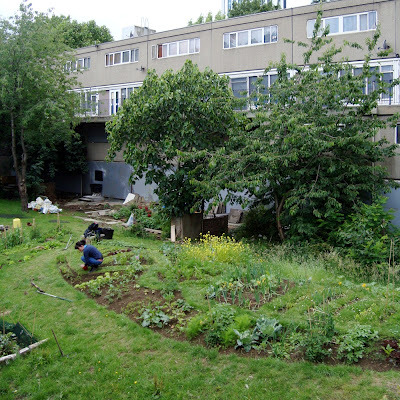 When the Heygate Estate was almost finally cleared of residents, some local people began muttering about how the site itself should not be just put behind hoardings for years and years. As the land is still publicly owned those trees and garden areas are still considered ours, so the public spaces within and some of the buildings should be use for temporary benefits to continue to offer something to local residents rather than being a walled off non-space that waits on the developers profits. There was even a day long gathering organised by Elephant Amenity Network of local folks to discuss and plan what sort of interim uses they wanted to push The Council and developers for. A large report of the days wishes and desires was published with an emphasis on people being able to still both enjoy the green spaces of the estate and also to focus on future gardening, food growing, space for community gatherings, space for creative endeavours, space for sports and recreation and even a call to maintain short life housing within the estate if the flats were to be empty for another 2 or three or more years. It must be said that despite this engaged and positive forward thinking, the battle with The Council and Lend Lease for temporary uses has not resulted in many real gains. 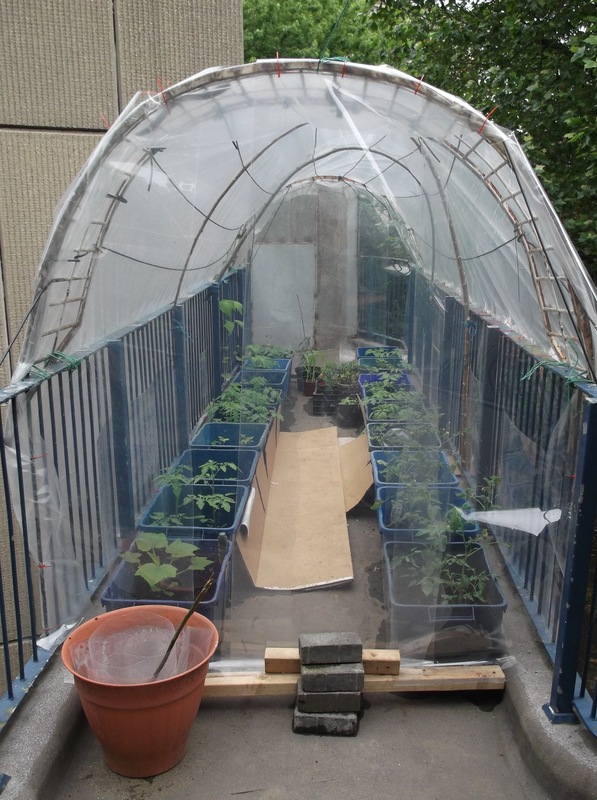 There is the Mobile Gardeners project on Wansey St and there is also the giving over of the old Doctors Surgery on Heygate to Reuben Powell, a local artist. The battle for continued access to the lovely Rose Garden is still a sore point and the new fencing-off of the estate has meant access to the community pond, poly-tunnel, allotments, occasional Heygate cinema and growing areas has been stopped. 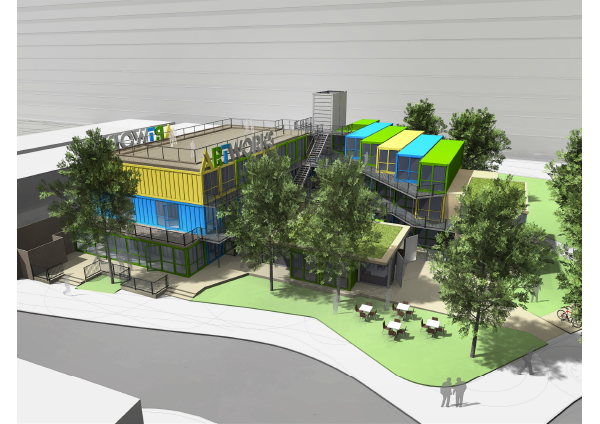 The proposed Artworks container park scheme was the 3rd item of ‘give’ that Lend Lease had finally committed itself too. Between September 2011 and June 2012 various small meetings and consultations were held to generate interest and discussion on the scheme. It was suggested that the soon to be empty site where the old Shell Garage was on Walworth Rd would be a suitable site for what was dubbed the ‘box park’ (after the trendy container ‘pop-up’ mall in Shoreditch). In May 2012 the Council sought tenders for the scheme and by March 2013 Artworks became the ‘preferred partner‘ to run the scheme at the ex-Shell site. 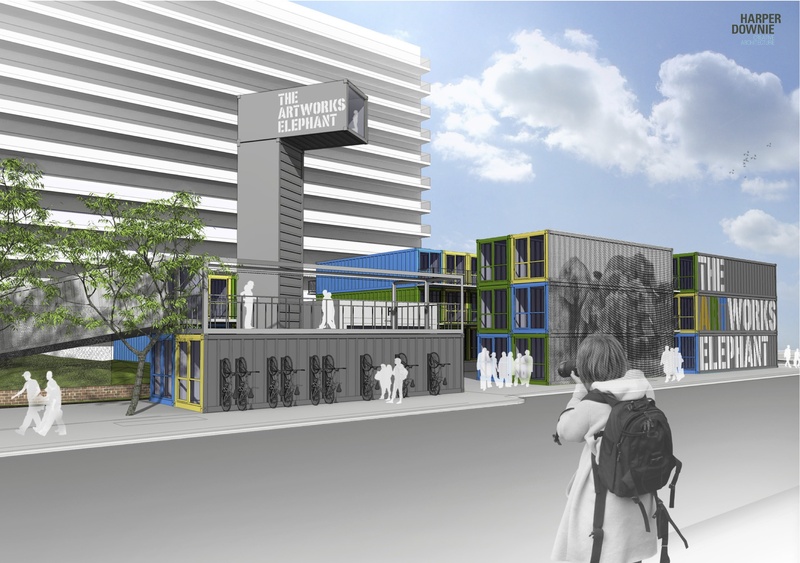 In late March Artworks presented their proposals at a Lend Lease-run Community Forum. 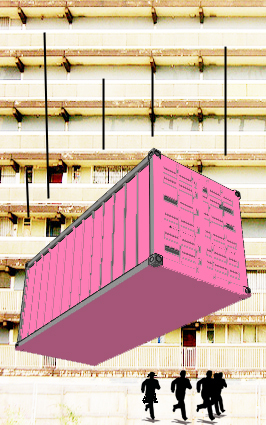 Although such a project needs planning permission and has to be subject to many and varied considerations and conditions stemming from Southwark Planning policies, strangely enough Artworks were able to deliver 48 containers to the site. You can contrast this un-permitted dumping with the recent flurry of warning notices to named businesses on Walworth Rd who use the pavement for a couple of chairs outside their caff or to display a few wares or two. 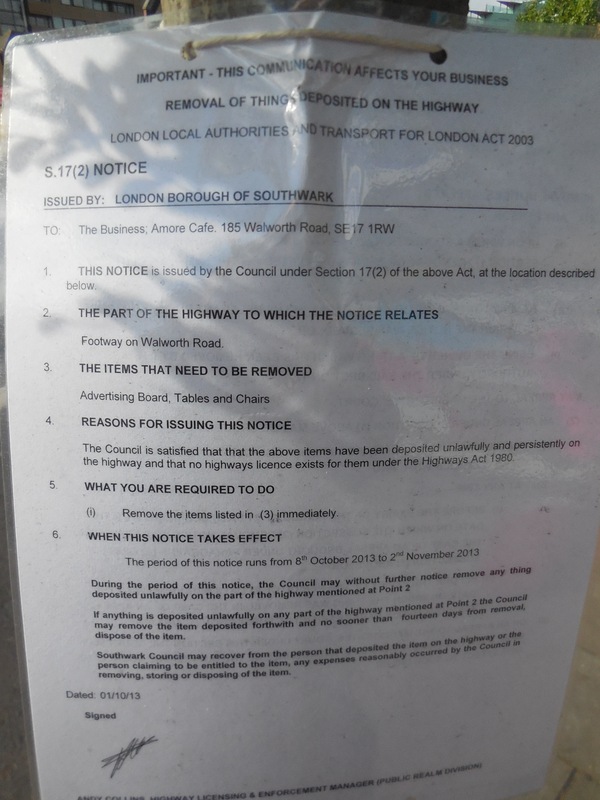 Bearing in mind the desperate retail crisis facing those traders and the truly independent nature of those small businesses, you’d think the Council would try and support them out rather than getting all heavy and pedantic! 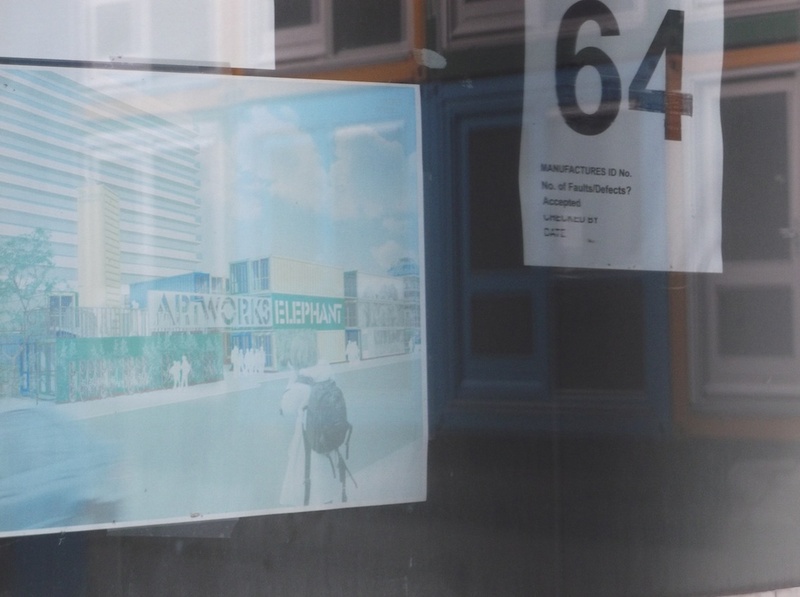 It was a month later when Artworks applied for permission for the ‘Erection of 48 modular units to accommodate business/workspace, retail, markets, cafe/restaurant, gallery, community, and stay-work uses (Use Classes B1, A1 to A5 inclusive, and D1) together with ancillary structures and the change of use of the existing former petrol filling station kiosk to cafe for a temporary period of 5 years’. ‘The Development provides a number of key temporary benefits to the local community to off-set the need for any planning obligations’. “This Development provides an opportunity for the regeneration benefits of the wider Heygate Masterplan scheme to be delivered at an early stage in one of the early, and visible, interim uses on the Site”. Here it is still not actually clear what ‘benefits‘ they are being to the area with this unexpanded statements. Answers on postcard once again please! 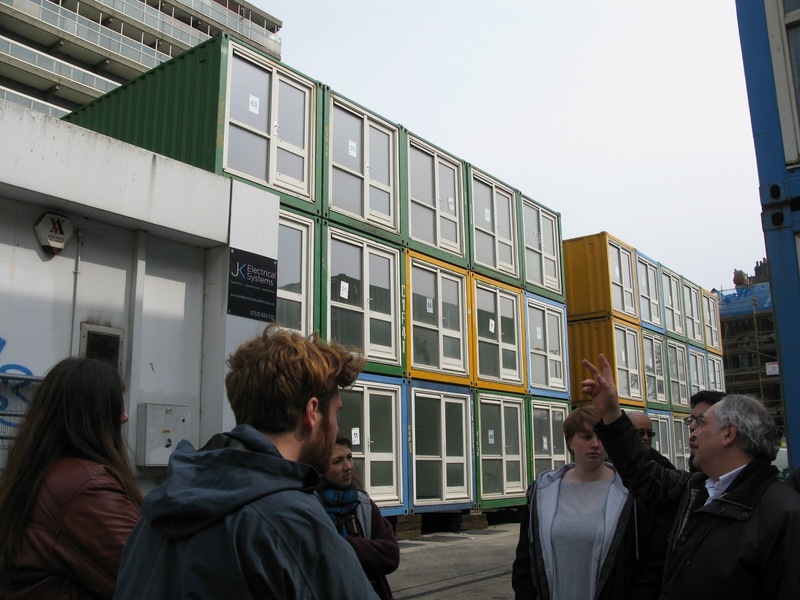 Around the time of the dumping of the containers, it was clear that the notion of community interim use was slipping slowly away as rumours of the containers becoming ‘Live / Work’ units with rents of £200 per week were starting to be heard locally. The ‘Live / Work’ units were then mutated into Artworks specially invented ‘Stay / Work’ units when they realised that residential studios would trigger an affordable housing requirement of them. Then the whole ‘live in a box and create art’ schtick began to slowly disappear from their promotions in favour again of non-residential studio, retail and market space. The artists were on that day conducting their own cheerful consultation with tea and cakes on what local people thought about the containers and getting them to fill out the official consultation form. Have to say that overall out of about 100 conversations most passersby thought the scheme was a bit useless and also unworkable both as a site and with those rental rates. Paul Coleman wrote a nice piece about this spontaneous site visit. Months later, in September 2013, with nothing happening at the site and still no planning permission yet granted and with very little fanfare other than a dismal Twitter campaign (“Happy Friday people! What’s everyone got planned for tonight?‘ or ‘Good morning people of twitter! We hope you have a great week! !‘*) and some fading A3 posters in a few of the containers, there was an Artworks Tweet bombshell. The whole thing had suddenly gone interstellar. Yes, the game was well and truly upped when Artworks announced that due to the fire at Cuming Museum next door to their planned site, they would be moving to a new site at Elephant Rd instead to ‘facilitate repairs to the Town Hall that was seriously damaged in the fire‘. This is a somewhat disingenuous statement. 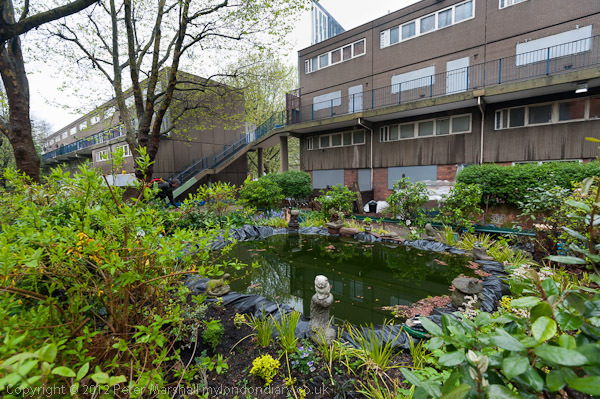 Garland Court TRA in Wansey St although not against the scheme had objected to their planning application on the basis of possible noise and lack of proper consideration of public toilets, impact on local views, parking and litter among other things. Lend Lease had also announced a change of the phasing of the Heygate development that meant that the Shell site and environs would no longer be vacant for 5 years. Any road up, the new project now ups the number of containers to 56. Anyhow, after this long starter, we get to the main meal of our disgruntlement which is that we live here, we know what’s going on, we haven’t forgotten what’s happened so far and so we won’t be taken in by the Spin. What is it about regeneration and in particular, ‘regeneration’ at The Elephant, that attempts to erase what is both in front of our very eyes and what is a trusted series of memories in our heads? 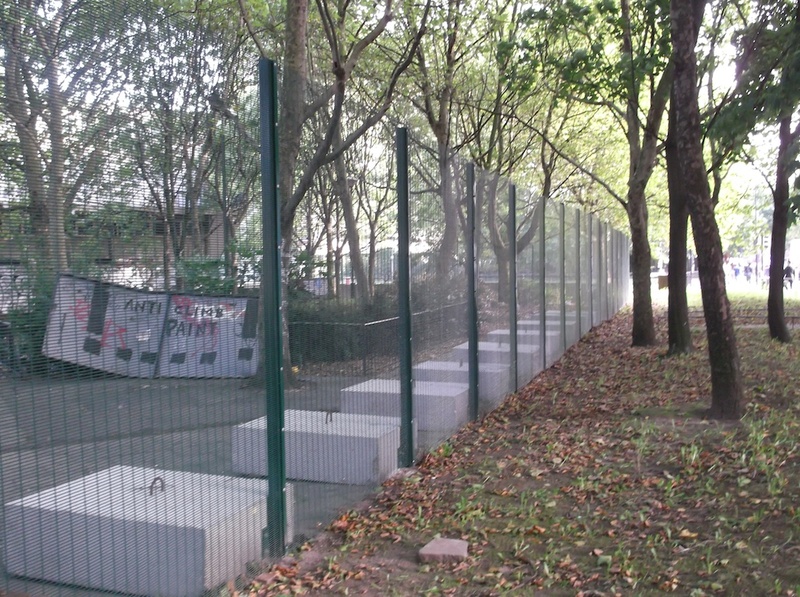 With this attempted amnesia in mind, we say again that the proposed Artworks site at Elephant Rd was the well-used open space that contained a large expanse of grass, large mature trees and a small kids playground. On Sundays, it hosted football between different local Latin American teams. 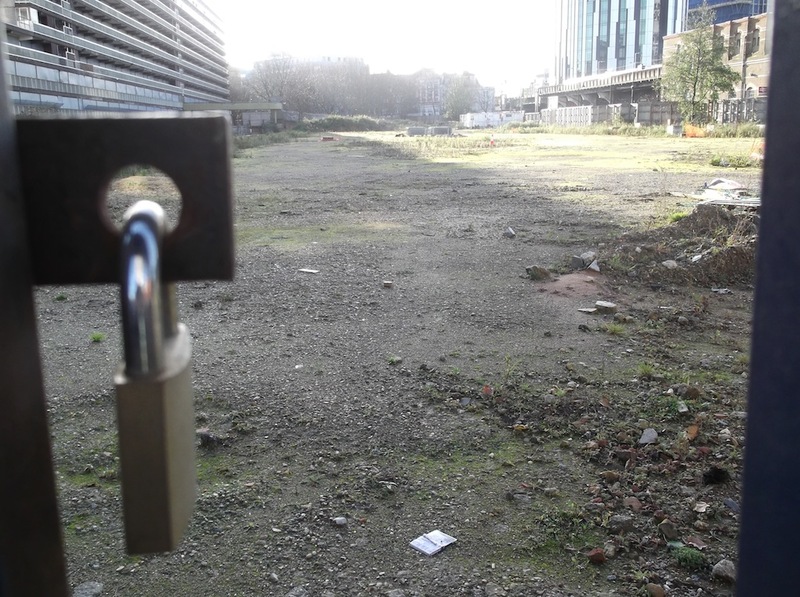 In February 2011, the well-used site was hastily fenced off by Southwark Council without any consultation to enable Oakmayne, the then developers of this long empty site, to function as a extra site compound for the development. This public land was then unaccountably enclosed to facilitate the future building of a private development (that funnily enough contains no social housing). Particularly galling was then how nothing happened and nothing is happening at that site with the proposed Tribeca Sq development. That space, those trees, that football, that community resource has been denied local people for two and half years now at the whims of a arrogant Council and a non-developing developer. No wonder we continue to question when the benefits for all of this regeneration will see something for us long term locals. So it is even more upsetting and rage-inducing when, once again, with no public further consultation (other than a paper one that is statutory for planning applications), Artworks now seeks to open up a public space that was taken away from us to run what is essentially a private business that then pretends to provide or will provide minimal community uses. 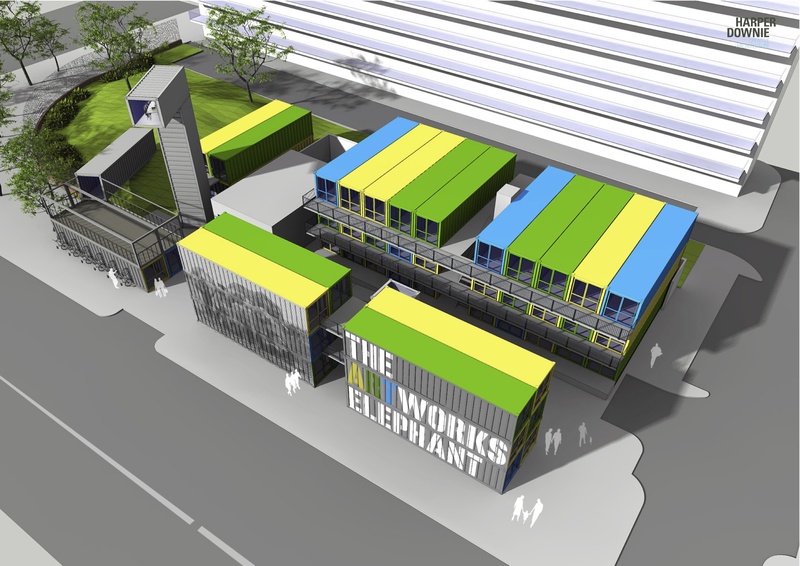 Planned rental costs will be: £180 per week for a 320sq ft container workshop / retail space. Electricity not included. £180 per week, including all bills, except electricity. Or smaller retail units at £80 per week (64 sq ft). There are also ‘hot desks‘ for £35 a week ‘for businesses whether it be a small company starting out or a large corporation on the go‘. Large corporations are probably about as far away from community interim use as we can imagine it. 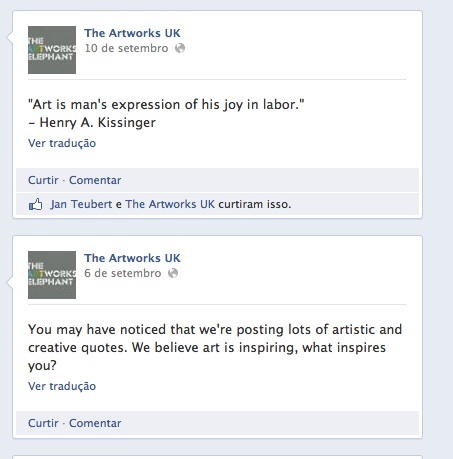 Will Artworks be renting a few hot desks to junior Lend Lease executives? So these are not cheap units really ‘predicated on affordability and aimed at business start-ups and incubator units‘ as was set out in their planning application. Comparable space in well-established studio buildings made of bricks and with actual large windows costs considerably less. Long term reputable studio companies such as Space or Acme are offering spaces well cheaper than Artworks (£720 approx) with studios for £300 or £400 a month (although it is not easy to get these). 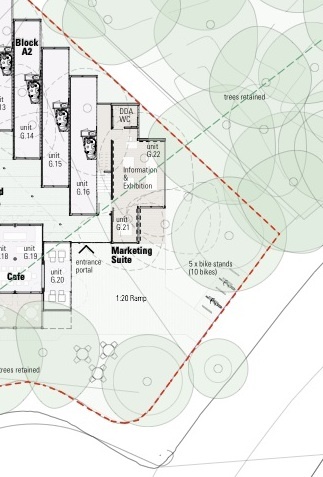 Commercial (non-metal) studios are also available for £500 a month for about 300 sq ft.
“7.19 The Development seeks temporary planning permission for 2 modular units to be used as a ‘pavilion’ to house an information centre and marketing suite (Use Class Sui Generis) for Lend Lease. Here Lend Lease gains a nice marketing suite to market their new buildings to the undoubtedly investment-happy Buy To Let landlords and the numerous overseas investors that will be snapping up places in Trafalgar Place and One The Elephant. How do you negotiate that one under the notion of community use? Here at Southwark Notes palaces we are endlessly critical of the ‘regeneration‘ that we are suffering at The Elephant but it is tiring to feel like we have to do our best to document these abuses and downright cynical behaviour from The Council and developers.We document it in the hope that at some point The Council and the developers might take seriously the fact that local people have a long and deep knowledge of the history of this shameful regeneration project. We have an acute and critical eye for detail when the hype and lies they spread tries to erase from the public mind the losses of council homes, public space and valued communities. However, in this instance, we base our argument not solely on slagging off how this regeneration is being run or how it is being sold to us as if we have no memory or anything to say on what is plain to see before our eyes. These rip-offs are so blatant yet the Council just spins it’s vile fairy tales in the press as if nothing was wrong or no-one was saying anything other. We also base our concerns on the roots that are local people who have come together repeatedly and put in their precious time to seek that genuine community benefits come to the area. They have put forward serious considered proposals for creative uses, employment chances, health matters and maintaining public spaces. But most of this has been ignored except where it suits the needs or a developer that can easily use a few small and heavily sanctioned projects to talk up it’s own accountability and working with the locals. Yet the battle of the local community with Lend Lease has been one long hard fight to gain very little. If the very first things you finally see getting built from the Lend Lease Masterplan is One The Elephant (starting price £325,000) and some wonky overpriced pseudo-trendy designer retail outlets in a metal box, you probably are wondering where you fit in to all this regeneration lark. 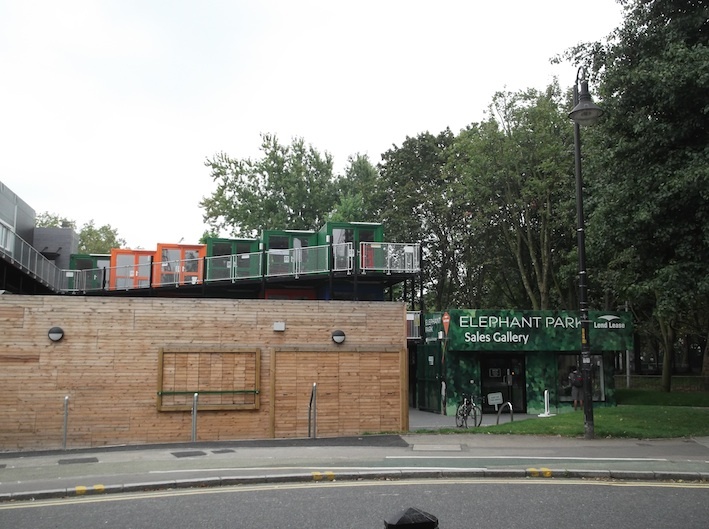 We couldn’t resist a bit off simple detective work to understand this seemingly shonky outfit that can get away with no planning permission for the arrival of 48 containers, cannot update it’s own website to say that the project is no longer on Walworth Rd and is able to make deals with The Council to get a new and much better site in the infamous enclosed Elephant Rd Park. All this from essentially a quite small scale and risky business plan. As we learnt from our long years doing this, business like this (i.e not Lend Lease or St Modwens) is a fairly boring and everyday affair of people knowing other people who can set you up with something or sort you out, go into partnership with etc. Here at Artworks, the Sam Minionis side is a kind of shipping container enthusiast with business connections to a property developing family who have a vague connection to some Oakymayne property thing from way back. He is a big part of the company My Space Pod that seeks to containerise building developments with a passion for re-using shipping boxes. Charlie Fulford is the markets side of things and also more of a property developer with a father who is both a serious market developer (establishing Camden Lock market in 1971 amongst others) and a Professor of Philosophy. What a carry on! 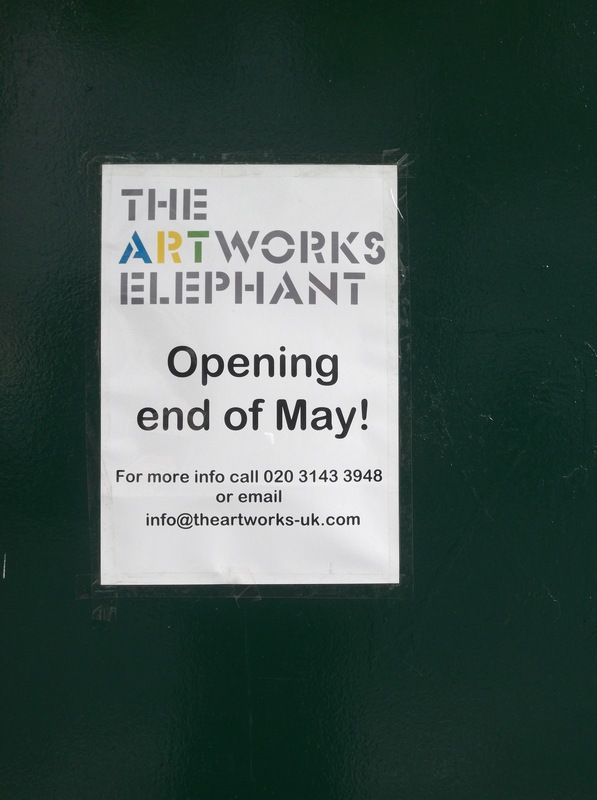 SEPT 2014: Er…it’s September and Artworks is still not open. Yet funnily enough the Lend Lease Marketing Suite up, running and open! 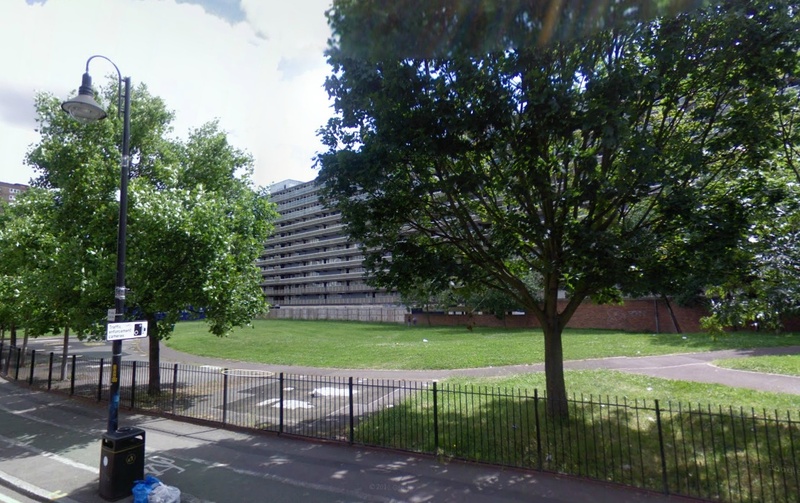 Heygate Vacant Possession Secured, Comes With Major Public Art Spectacle or Not! Here. We remember how Henry Kissinger signed the orders for the illegal bombing of Cambodia in 1969, a policy that led to an estimated half million civilian deaths. He also had a large hand in the legitimating via US foreign policy of military coups, death squads, disappearances and repression in several Latin American countries. A perfect and creative act and especially sensitive to the Elephant Rd Latin-American community.